Two people were injured after an apparent explosion at an auto repair shop in Beltsville, Md. Crews responded to 12340 Conway Road in Prince George's County for an explosion just after 2 p.m. There they found two individuals with non-life threatening burn injuries. 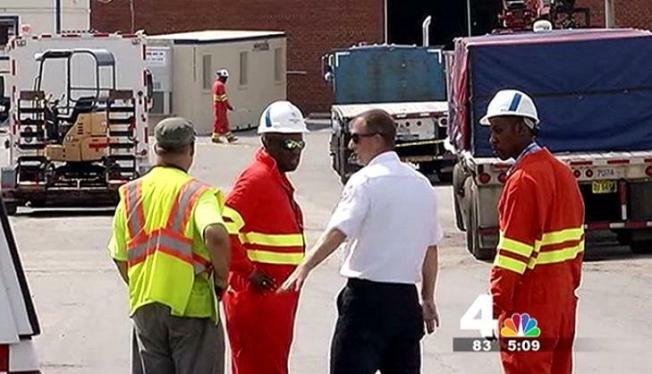 Mark Brady with Prince George's County Fire told News4 five businesses with about 50 employees near the site of the explosion have been evacuated. Brady said the two men were inside of a forklift when they drove over a manhole filled with natural gas, which subsequently exploded. "The problem is it was very into the sewer system and extended very rapidly to the outside atmosphere causing that explosion, allowing natural gas into these commercial buildings," Brady said. There is no structural damage to the building. Brady told News4 there is no chance of the manhole exploding again, even calling the event a "freak explosion" on Twitter. Stay with News4 and NBCWashington.com for more on this developing story.